The Globus Alliance is a community of organizations and individuals developing fundamental technologies behind the "Grid," which lets people share computing power, databases, instruments, and other on-line tools securely across corporate, institutional, and geographic boundaries without sacrificing local autonomy. We first participated in Google Summer of Code™ in 2008 and we found the experience extremely productive both for the Globus Alliance and the individual mentors, so we wanted to confirm the value of the program for the students who took part. We contacted our eight students from last year to find out what impact Google Summer of Code had on their lives and careers. While many of our students still remembered the experience fondly, and said it was valued highly by prospective employers, there were two students who had particularly remarkable stories. Last year, Artem Harutyunyan, mentored by Tim Freeman, developed a set of scripts on top of Globus Nimbus to dynamically deploy an entire AliEn Grid site (AliEn is the Grid infrastructure which is used by scientists participating in the ALICE experiment at CERN). His collaboration with the CERN and Globus Nimbus folks went beyond his Google Summer of Code work, and resulted in a new framework, called CernVM Co-Pilot, for execution of 'pilot' Grid jobs on cloud resources. His work is currently used in production to run Grid jobs from CERN'S ALICE experiment, and there are plans to extend it for the execution of ATLAS and LHCb jobs. Artem also co-authored two papers on his work: "Dynamic AliEn Grid Sites on Nimbus with CernVM" was presented at the 17th International Conference on Computing in High Energy and Nuclear Physics (CHEP 2009) in Prague, and "Building a Volunteer Cloud", which includes a description of CernVM Co-Pilot, was presented during the Latin American Conference on High Performance Computing in Mérida, Venezuela. Joana M. F. Trindade, mentored by Tom Scavo, spent last summer implementing a Holder-of-Key Single Sign-On profile handler for the Shibboleth Identity Provider in Globus GridShib. And, since then, things have just been getting better for her. Thanks to her outstanding summer work, she was offered an appointment as a Visiting Scholar at UIUC, where she worked on researching fault injection in virtual machines with Professor Ravi Iyer. After six months in that position, Joana was offered admission into the masters program at UIUC, where she is currently working with Professor Marianne Winslett. More importantly, Joana tells us that participating in Google Summer of Code gave her a renewed sense of confidence in her research abilities, having previously thought that her academic background was insufficient to gain admission into a top-tier university in the US. Joana tells us that "After Google Summer of Code, I regained that hope, and I must say I'm really happy to have found a topic in Globus to which I could contribute, and that in turn opened so many doors for me." Congratulations Artem and Joana for all you have achieved! Our first Google Summer of Code last year also had its fair share of challenges, including two students who didn't make it through the program, but it gave us the opportunity to learn a lot about how to mentor and manage summer students. We were fortunate to be selected again this year as a Google Summer of Code mentoring organization, which allowed us to apply everything we learned. First of all, we required students to provide more information about their background and the project they were proposing. Last year our student application form was essentially a blank form saying "Tell us about your project here," so this year we presented prospective students with more specific questions. We also decided to check in with our students more often which, at least in one case, allowed us to identify a problem between a student and a mentor early on, giving us time to deal with it constructively before the midterm. In the end, applying what we learned during last year's Google Summer of Code and as well as the Mentor Summit had a noticeable effect. We were fortunate to be given ten students to mentor, and all ten students passed. Furthermore, our mentors report that practically all the code written by the students has either already been released or will be released soon. In fact, overall, we felt that this year's students rocked. Here's a summary of their summer work. The Globus Nimbus cloud toolkit allows you to turn your cluster into an Infrastructure-as-a-Service (IaaS) cloud. However, it was mainly geared towards managing a single cluster. Not any more! Adam Bishop, mentored by Ian Gable, worked hard over the summer to add new components enabling multiple cluster support for Nimbus. He developed a series of production-quality plugins, which have already been committed to the Nimbus source repository, that publish the state of Nimbus cluster back to a Globus MDS Registry. This allows the availability of cloud resources across multiple Nimbus clusters to be gathered together into a single registry, which is the first step towards adding cross-cluster support to Nimbus. Another student, Jan-Philip Gehrcke, mentored by Kate Keahey, also spent the summer with his head in the clouds, but in a good way: he developed the Clobi project, a job scheduling system supporting virtual machines (VMs) in multiple IaaS clouds, with support for Globus Nimbus and Amazon EC2 clouds. In a nutshell, there are many scientific applications that are typically run as "jobs" on a compute cluster. Jan-Philip's project allows these jobs to be submitted to a cloud instead of to a traditional compute cluster. The most interesting use case is when a site operates a Globus Nimbus cloud and, during peaks in demand for computational capacity, extends its capacity momentarily by spilling the jobs over to a second (or third, or fourth, ...) cloud such as Amazon EC2. Although Clobi is not tied to any particular application (its design is generic and should be useful whenever it’s convenient to distribute jobs across different clouds), the motivating application for Clobi is ATLAS Computing (for the LHC's ATLAS experiment at CERN). In fact, by the end of the summer, Jan-Philip was able to run a common ATLAS Computing application (the so-called “full chain”) successfully with Clobi. If you want more details about Clobi, check out this blog post written by Jan-Philip. Enough about clouds, let's move on to the exciting topic of data. Globus GridFTP is a high-performance, secure, reliable data transfer protocol that is pretty good at moving data. Fast. Of course, there's always someone who wants to go even faster, like Shruti Jain, mentored by Michael Link. Shruti took globus-url-copy, the GridFTP client, and added a 'sync' feature that allows a local and remote file to be synchronized, by sending only the changed sections of the file. This results in more effective bandwidth utilization by avoiding redundant data transfers. Remember Mattias Lidman? We certainly do. In last year's Google Summer of Code, he developed a compression driver for the Globus XIO input/output library (which GridFTP depends on) to compress/uncompress data as it passes through it. However, although moving data faster is all good and well, it's not worth much if it somehow gets corrupted in-flight. So this year, Mattias, mentored by Joseph Bester, continued to work on Globus XIO and developed a Checksum Driver. Mattias's driver checksums GridFTP data streams allowing both ends of a GridFTP transfer to verify the integrity of the data. You know one really cool thing grids are used for? Cancer research. The Cancer Biomedical Informatics Grid, or caBIG®, is an information network enabling all constituencies in the cancer community – researchers, physicians, and patients – to share data and knowledge. caGrid is the underlying service-oriented infrastructure that supports caBIG, and it relies heavily on the Globus Toolkit. Some of the data services in this architecture use a query language called CQL that is, well... complicated. To make life easier for scientists, Monika Machunik, mentored by Wei Tan, wrote a plug-in for Taverna (an open source tool used by scientists to design and execute workflows) for constructing CQL queries, allowing scientists to focus on their work rather than on the intricacies of the CQL language. Carlos used the Google Web Toolkit to develop this application, which is totally decoupled from GridWay, making it easy to install it alongside existing installations of GridWay. In fact, you can download the GridWay+Google Maps application and check out its documentation, including more screenshots, at the application's page on the GridWay site. 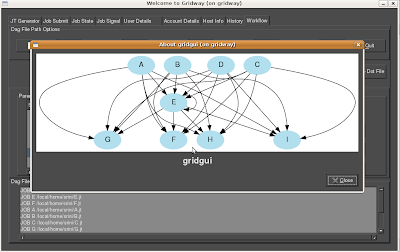 Srinivasan Natarajan, mentored by Jose Luis Vazquez-Poletti, worked on a more administration-oriented GUI for GridWay, allowing users to compose, manage and control their jobs instead of using the command line interface. 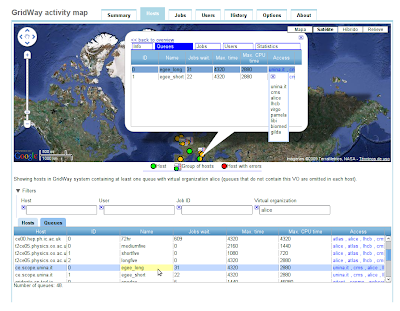 This GUI includes a host of other features, such as host and user monitoring, filtering account statistics and execution history information, and support for processing DAGMan workflows, including visualizing dependencies between jobs in the workflow. Both of the GridWay projects were presented in several sessions, including one on nuclear fusion, at the EGEE'09 conference in Barcelona, Spain back in September. How about we get back to the subject of data management? The recent addition of UDT (UDP Data Transfer) support to GridFTP has made even faster transfer speeds possible. You guessed it: here's another student who couldn't resist the need for speed this summer. Jamie Schwettmann, mentored by Raj Kettimuthu, sought to characterize the performance of GridFTP over 10Gb/s networks, specifically to measure the speed increase given by UDT as compared to TCP transfers, as well as a number of other considerations such as CPU and memory overhead at both ends of the transfer. In doing so, they decided to develop an automated GridFTP benchmarking and throughput optimization utility called globus-transfer-test, which takes URL pairs from a list or on the command line, and allows for varying input parameters such as parallelism level, transfer type (memory-to-memory, disk-to-disk, etc), TCP Buffer Sizes, MTU sizes, and all other standard globus-url-copy options (except multicasting) and when possible, compares with other performance and throughput utilities such as iperf or scp. Designed for general use by users or administrators as well as to carry out our performance characterization, globus-transfer-test aims to provide enough information to optimize GridFTP options for maximizing throughput between grid sites. This common need has allowed collaboration with many other projects and organizations in the course of development and testing, including the US ATLAS Project, TeraGrid, and OSCER. Jamie even presented a poster on her project at the 2009 Oklahoma Supercomputing Symposium. And we'll end with the ever-popular subject of data management. Melissa Weaver, mentored by John Bresnahan, developed a PSK driver for Globus XIO. She first developed a program that, using OpenSSL libraries to encrypt and decrypt data using a stream or block cipher of the user's choice, allowed her to experiment with different lengths of keys and initialization vectors and different file sizes to make performance measurements. Then, she developed the XIO PSK driver itself, which used the results of the first program to implement an RC2 block cipher to ensure any communication between computers, once a connection has been set up, is secure. High energy physics experiments at CERN! Cancer research! Nuclear fusion! Cloud computing! Fast data transfers! Oh my! Oodles of congratulations to our mentors and students for all their hard work and for making this such an awesome Google Summer of Code for the Globus Alliance!